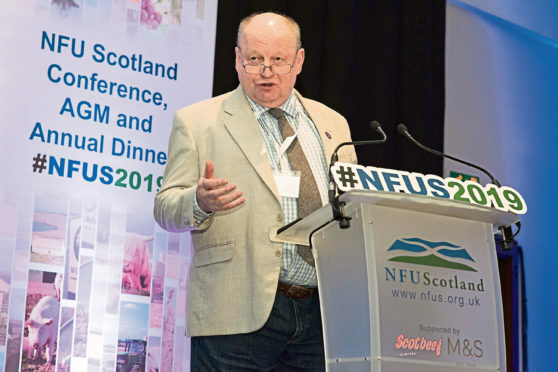 Beavers, badgers and buzzards surpassed even Brexit as a bugbear for the Scottish farming industry at NFU Scotland’s annual conference yesterday when growers from across the country vented their frustration over what they see as a lack of wildlife management by Scottish Natural Heritage (SNH). Farmer after farmer stood up at the Glasgow gathering to give accounts of diminishing numbers of waders and hedgehogs on their land, the destruction of trees and waterways, and intense predation by sea eagles on hill lambs. “It’s very different from what you see on Springwatch,” said Aberdeenshire farmer Patrick Sleigh during a debate on pests, predation and policy. Perthshire producer, Jim McLaren said Tayside beavers were being protected despite successfully expanding their range on a weekly basis; Patrick Sleigh said badgers were out of control in Aberdeenshire; and from the west, David Colthart claimed that in some areas the impact of sea eagles on hill farming livelihoods was so severe the time had come for the birds to be removed. While the membership’s demands for more control of wildlife didn’t sit comfortably alongside union president Andrew McCornick’s call for more cognisance to be given to agriculture’s environmental credentials, he argued that farmers were unfairly getting the blame for falling numbers of wildlife. SNH chief executive, Francesca Osowska told the conference her organisation couldn’t deliver nature without farmers’ co-operation and that she understood some species caused the industry difficulty. She insisted SNH was looking at mitigation schemes which made it as easy as possible for farmers to deal with damage to land, crops or businesses.